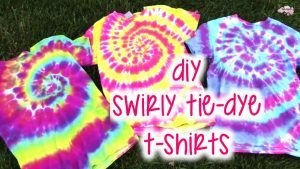 Tie dye is a fun way of dying fabrics in vibrant shades, being one of the best ways of creating colorful patterns for shirts and tops. 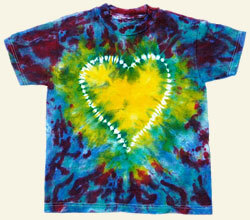 You can come up with all sorts of designs from spiral or striped patterns to a heart or the fan hold tied prints. 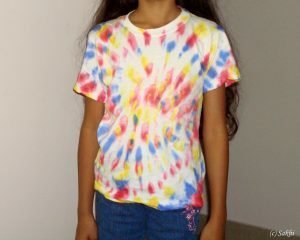 You can also opt for tie dye kits to make your job easier, especially when tie-dyeing with kids. It can be a great activity idea for parties, sleepovers and summer camps. Who wouldn’t love to have a cool shirt with the yin-yang pattern in red and blue? 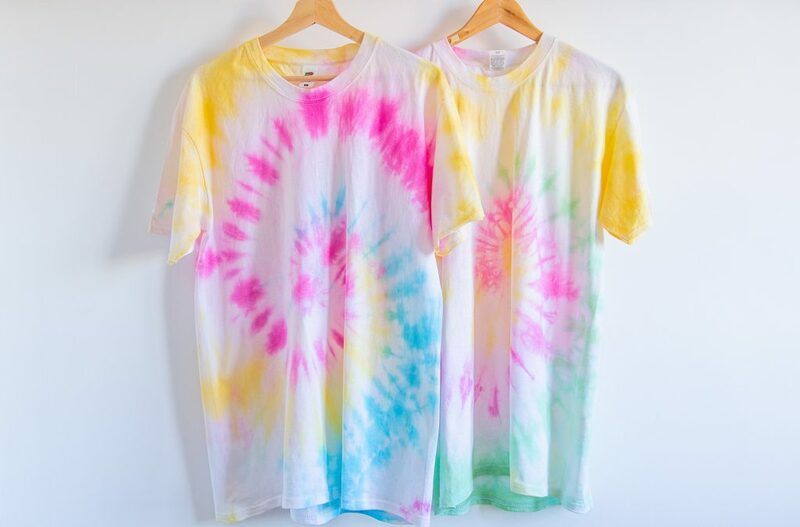 You are free to pick any two-color combination of course. 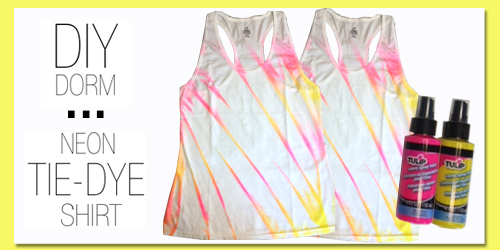 You can even work in one color, combining it with white. 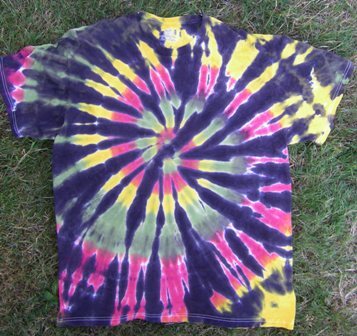 It is hard to believe that you can turn a plain white shirt into this within a few hours, right? 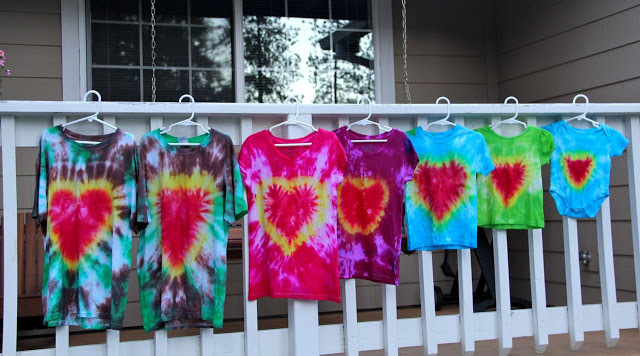 Here is a perfect way to come up with a unique Valentine’s Day gift. 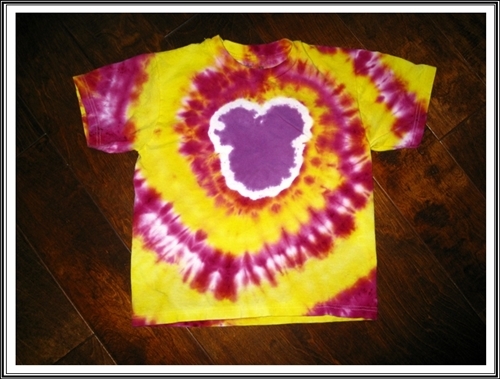 The bright yellow color, along with the white marks forming the heart design, makes the pattern even more special. 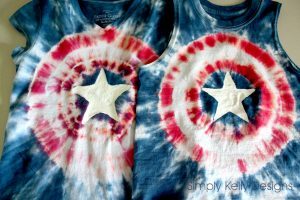 Disney and Mickey Mouse has made their way into every field of art, craft and textile making with tie dyeing being no different. The iconic Mickey pattern works wonders when dyed properly, especially when there is a bright white outline to make it more prominent. 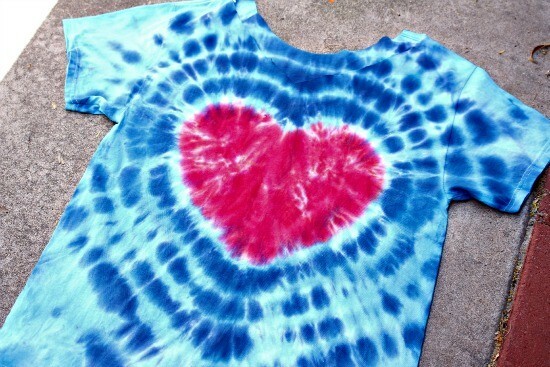 Here is a rather unique and colorful pattern with different shades of blue in the background of a bright red and traces of yellow. 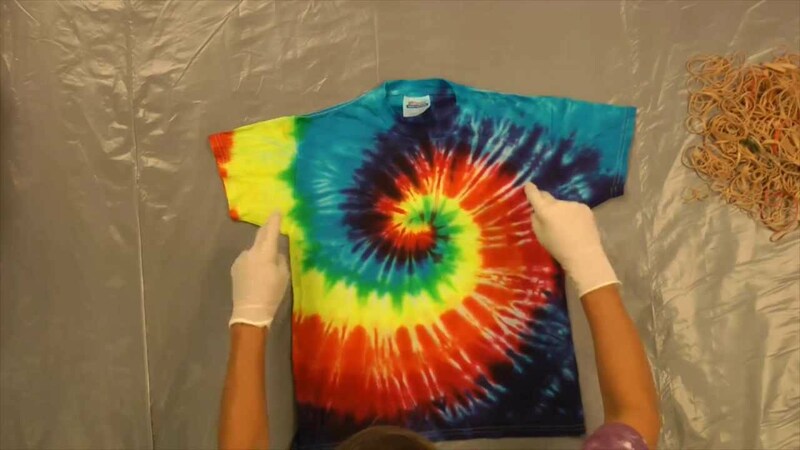 The star pattern really works for a tie dye project as, in addition to providing a scope to experiment with different colors, it also offers a chance to have fun deciding how many points will your star have. 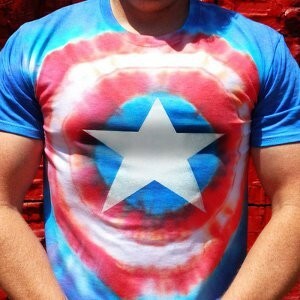 This one could be a refreshing change from the store-bought Superman and Spider-Man t-shirts. 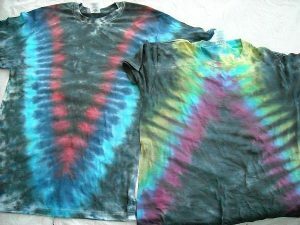 Initially looking pretty similar to a spiral tie dyed shirt, giving it a second glace will show how unique and stylish the bull’s eye design is. 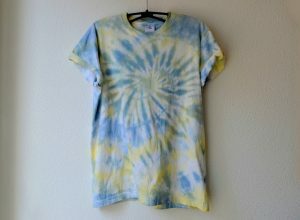 An easy one to work on, it is suitable for beginners, just learning the wonders of the tie dyeing technique. Everybody is bound to love this timeless black and white pattern. 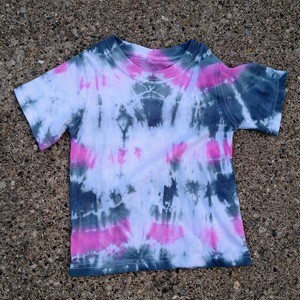 The classy design really works for a full sleeve shirt, but you can try it on any style of plain white t-shirt. The soft light blue-white pattern is perfect for warm summer days as the shirt looks so comfy that you probably can’t wait to start working on this one. 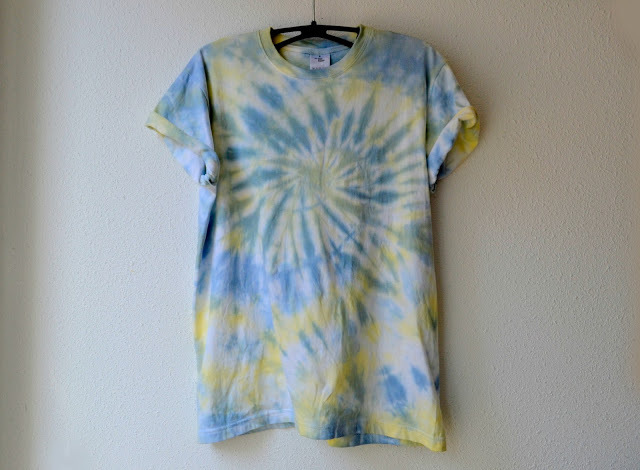 Who said that tie dye is not for denim? 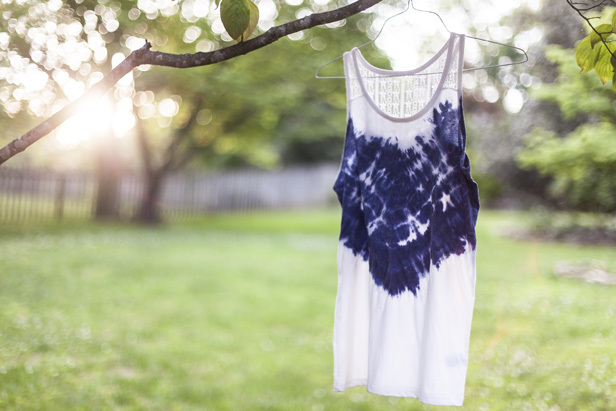 The blue white pattern of this tie-dyed denim shirt is much cooler than any simple blue denim shirt. Another simple heart pattern, the DIY tutorial shows you how cool it is to make one of these trendy shirts for each member of your family. The baby onesie looks so adorable. 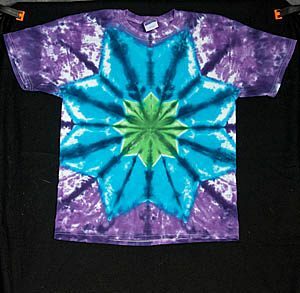 The piece symbol is another popular choice for tie dye shirts. 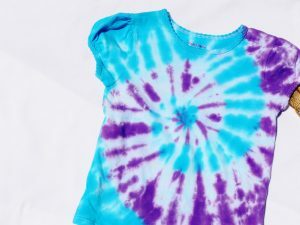 A different way of dyeing clothes, this one involves making the designs with colorful Sharpie markers before working to spread the ink with rubbing alcohol. 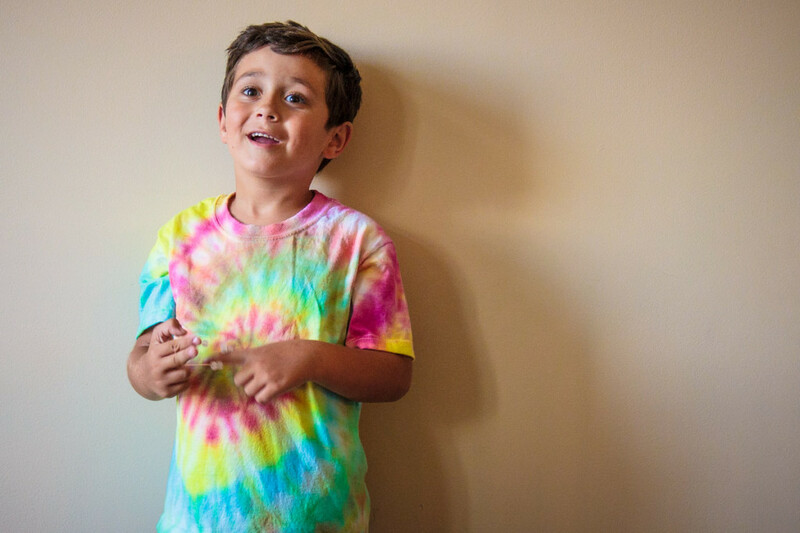 A colorful tie-dyed shirt looks adorable on your cutie pie as well. So go ahead and start working on a tiny white t-shirt, using whatever color you want to see your little one in. 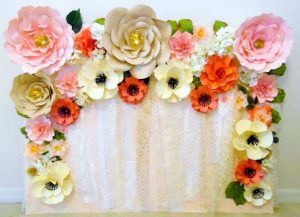 Soft, pastel shades work best for this purpose. 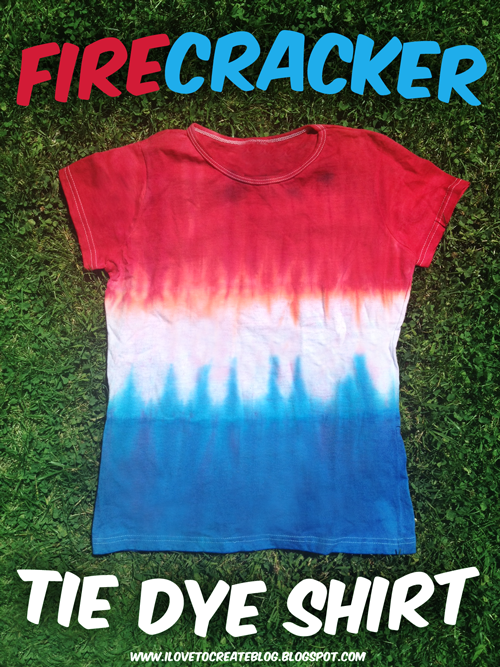 A simple red-blue-white tie dye project, the ombre patriotic design makes it so special. Once you master the procedure, you can experiment with other colors as well. 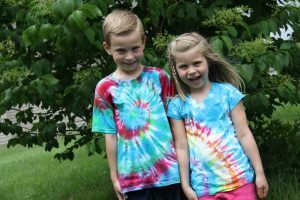 The method for working this pattern is pretty simple, involving working on a regular round tie-dyed shirt in black and orange before drawing eyes, nose and mouth on the round orange marks to create smiling Jack-o’-lanterns. The spider web one is worked in the same manner. A creative design, this one involves dyeing just the upper front area of the shirt, rather than tying the whole shirt to put into dye buckets. The snowman pattern has always been so popular among kids and adults that everyone is bound to love this cute snowman on their tie-dyed shirt. 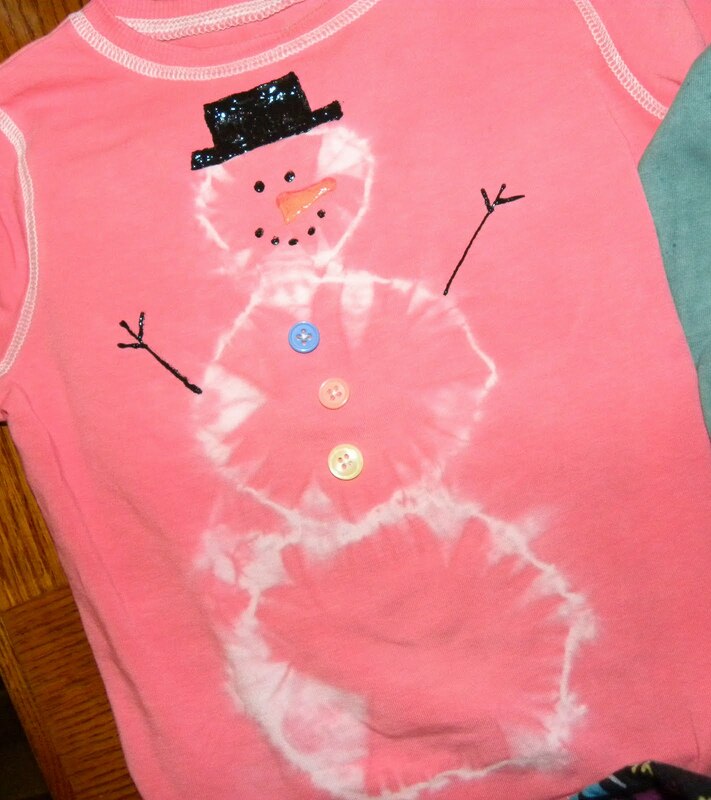 Of course, the snowy design brings a Christmas charm with it. 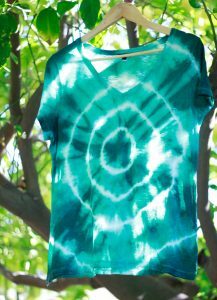 A spiral design with streaks of different colors radiating from the center, a shirt dyed in this pattern will be ideal for a day out at the beach or a casual day spent with friends. A basic, one-color pattern, you can work this one with any shade of blue, yellow, green, orange or any other color you can think of, and the end product is sure to be as trendy as possible. This pretty pattern actually reminds of a box of crayons with its random colorful markings. 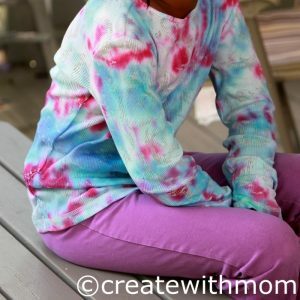 An adorable and easy pattern, this tutorial gives basic instructions for tying a shirt in preparation for dyeing it is mild pastel shades. So those of you looking to learn the method will find this one useful. 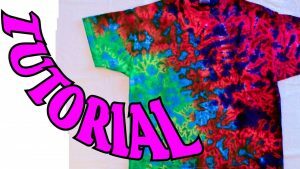 This tutorial shows how to work on a colorful spiral tie dye pattern and a bright circular design. All the patterns are worked in blue and pink, but you can use other combinations such as red-blue and yellow-green. Another trendy and popular tie dyeing pattern, this one involves folding the shirt diagonally, in the same manner as if folding a sheet of paper to make a fan. 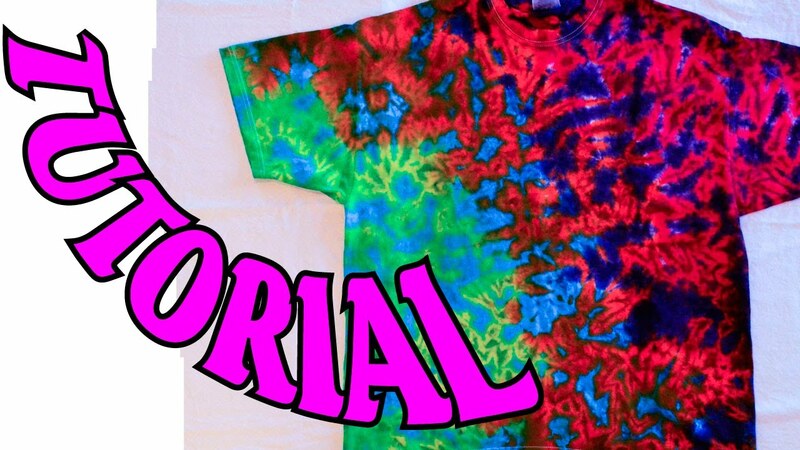 Watch the video tutorial to see how simple it actually is. How about making a couple of matching tie-dyed shirts for your kids? You may even consider going the whole way and create a matching set for the whole family. 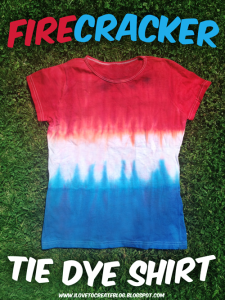 Another patriotic pattern so aptly named the firecracker tie dye pattern. It is actually pretty easy to work on with a simple tying technique. 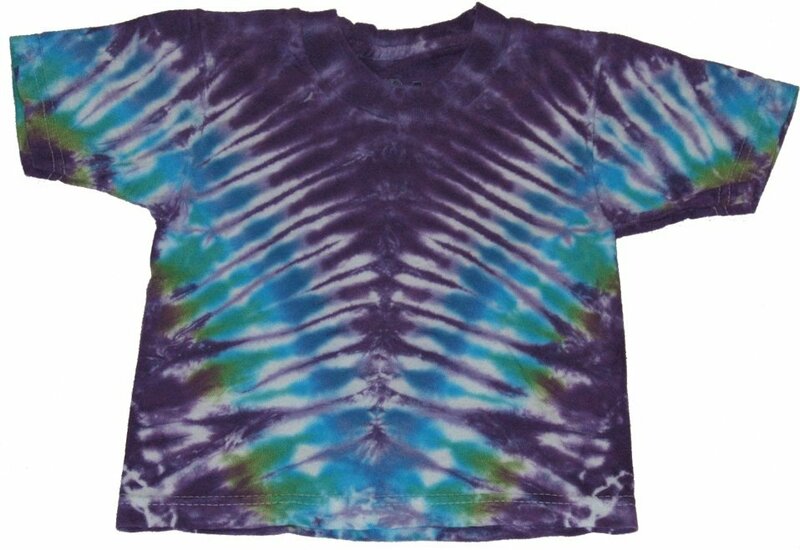 The colors blue and violet are working for this one. 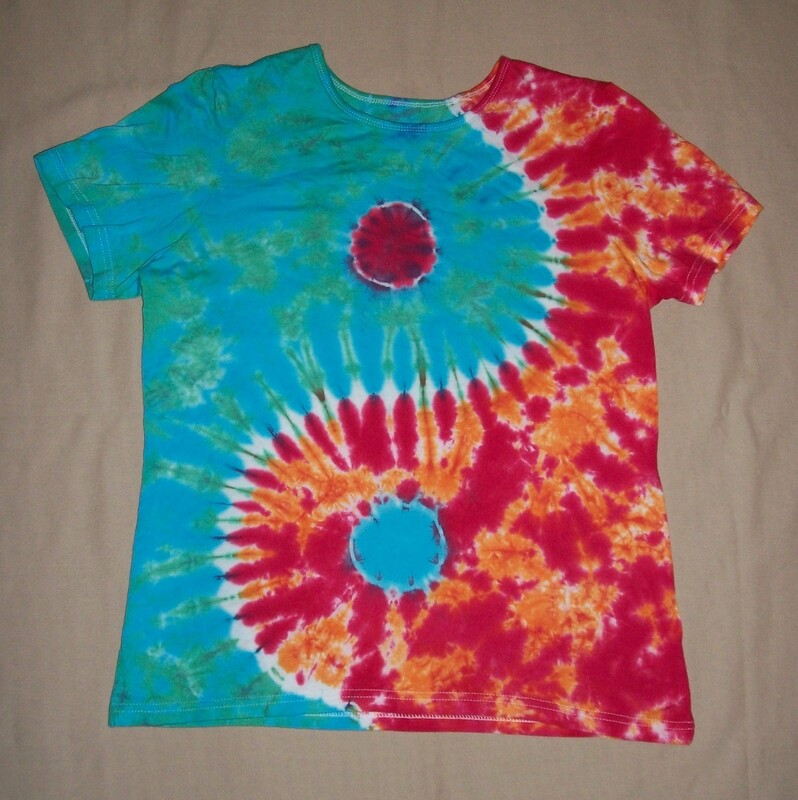 Some other combination ideas include pink-blue, green-yellow and orange-green along with the classic black and white. 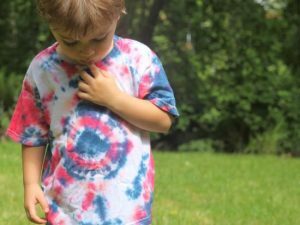 The perfect tie dye project for the 4th of July holiday, it is suitable for proficient tie-dye artists as well as those in need for some practice. The ‘V’ shape tie dye pattern has become pretty common; so, how about working on an inverse “V” design that is sure to compliment your creative skills? 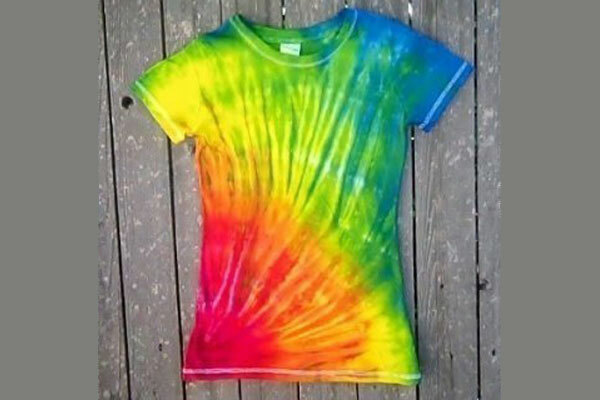 Now that you have learned the simple tie-dyeing method, there is no reason to spend a lot of money on the tie-dyed top you liked at the shopping mall. 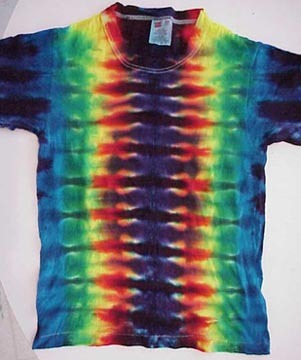 Just check out the pattern carefully and buy a white shirt to try your hand at the same design. 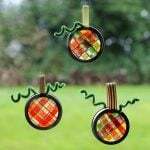 You might even end up with an even better pattern! 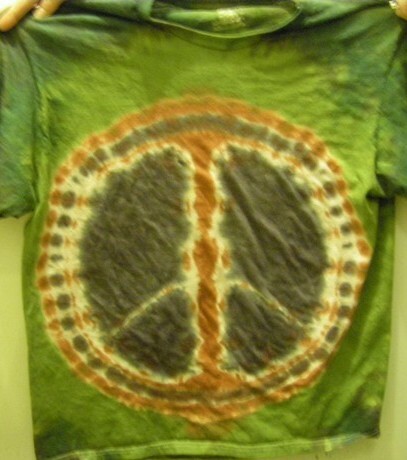 Thanks for including my designs, the Rastaman on Black Spiral and the Camouflage Peace Sign. 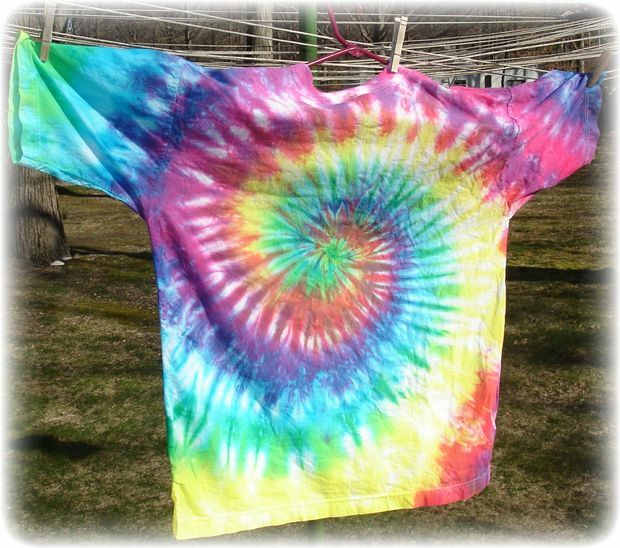 Good luck tie dyeing everyone!!! PEACE! 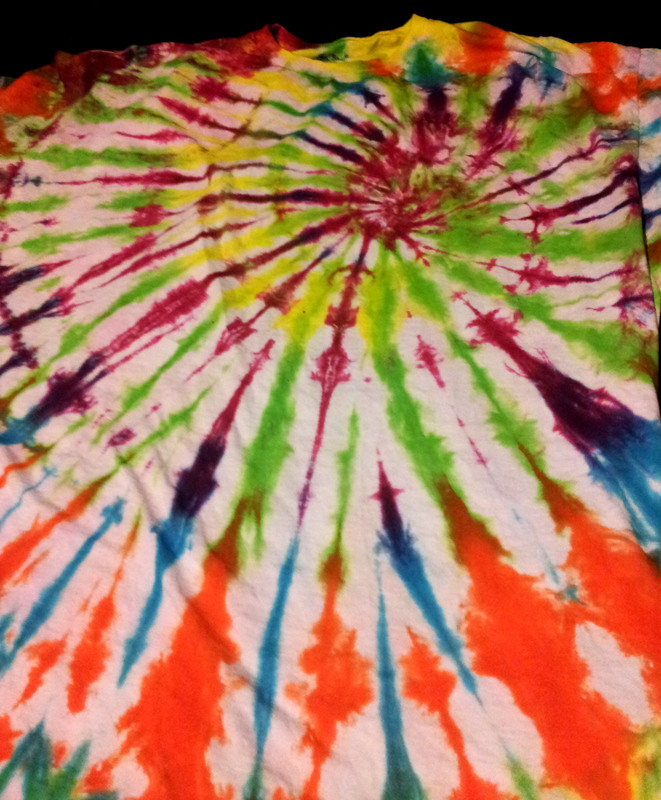 hi!i’m from fiji and i would like to know more about tie and die.Especially the different foldings that gives out the different patterns on the cloth as i have alot of white bedsheets with me. i really liked all the different kinds of patterns and i hope that you will teach me some patterns and the folding as well please as a new learner.thanks. 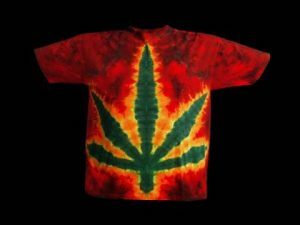 I’m a tie dye man but with only few patterns. However, I would love if you could please send me some training modules so I can improve my skills. Thank you very much for shearing with me. I hope you can send me an invitation for training soon. Hi. 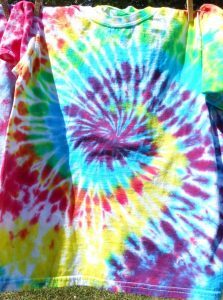 I was at a shop where the owner tie dyed her own fabric and made clothing from it. I have been searching for the technique she used but am unable to find it. Maybe you could help. She used only one color, blue. Her ‘stripes’ were vertical. What made her design unique was the stripes were not wide…very small and not always well defined. 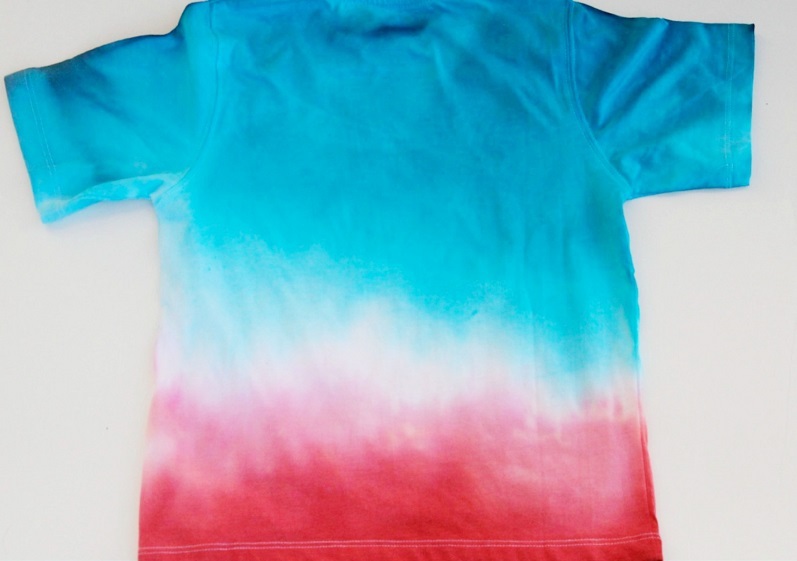 The bleeding caused the original dark blue to mute into light blue and then white. But very very small stripes. I don’t know if you would call them stripes. 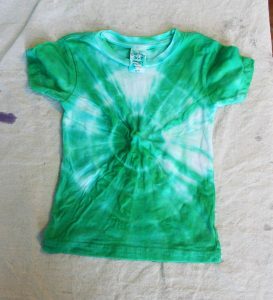 Just Fold the fabric from the bottom, up as though you were making a fan from a piece of paper. You can choose the thickness of the folds. I used this technique with approx. 1″ folds all the way up, then folded the folded shirt in quarters in order to make a tighter hold for the rubber bands. 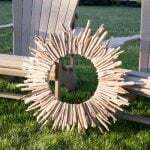 We squirted the die back and forth along the tops, “against the grain” and came out with horizontal lines that were more like a dashed line, thicker in the middles and spread thin at the edges of the lines. To spread the dye more thoroughly, after it sets for a little bit, you can gently squeeze the tightly rubber-banded shirt and give it the “bleeding” you likes. 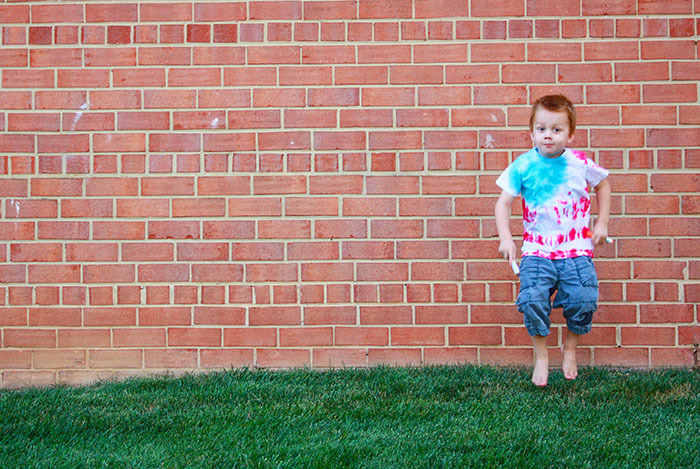 We were using a couple of colors, Red and Blue because I wanted some purple effects which we got nicely. For more solid stripes instead of the dashed line effect, I would suggest a thin puddle of dye that you set the folded edges of the rubber-banded shirt into, and allow it to soak for a little bit, then flip it over to soak on the other side. 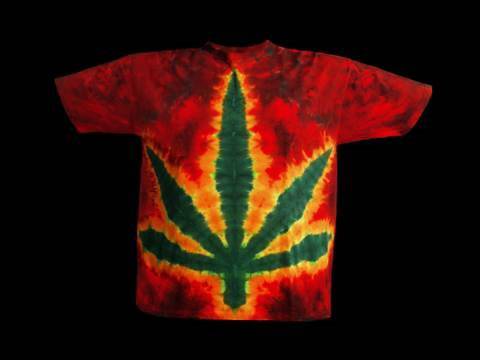 If your folds are thin enough, the colors will come together. If you folded thickly, then some squeezing and/or a deeper dye dip might be needed for the color (or colors) to reach each other. 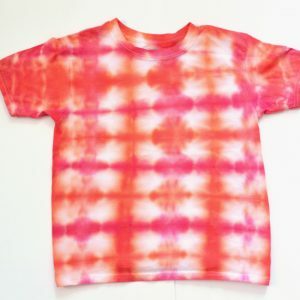 I just wanted to ask by any chance do you know a tie-dye technique that kinds of looks like a crackle effect? 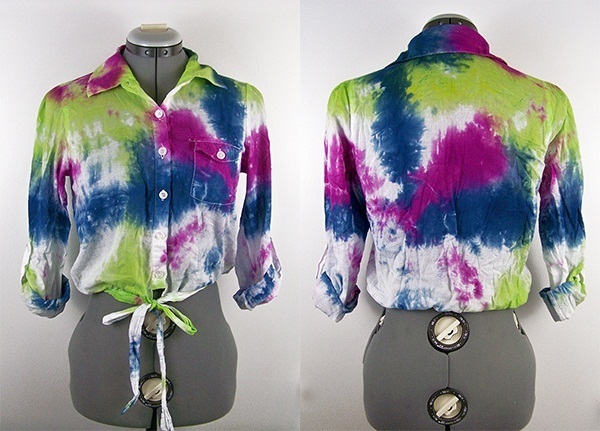 Hi Catherine…I guess the less mess tie dye shirt tutorial would help you get the crumpling effect. You can go through some of the other tutorials by clicking on the green headings above the images and find it out. 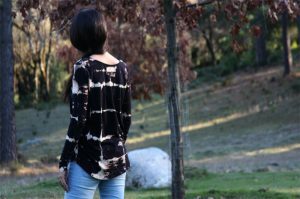 Great patterns and feedback are provided here. Nice work. 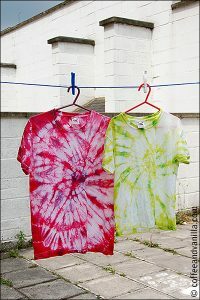 Awesome dyeing patterns, hope to see more updates. Your directions are very clear and complete. Thank you very much for all the steps and pictures along the way. I also like your style of writing. 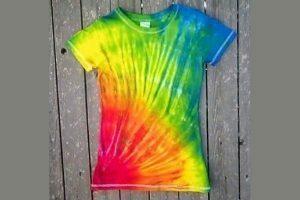 I’m going to try my second ever tie dye this week! Thank you for giving me the knowledge about tie dye. I’m very interested to do my own. 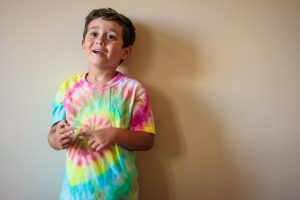 I am looking for printable diagrams for special education students. Do you have such a thing? Tie-dying doesn’t involve printable patterns as such. 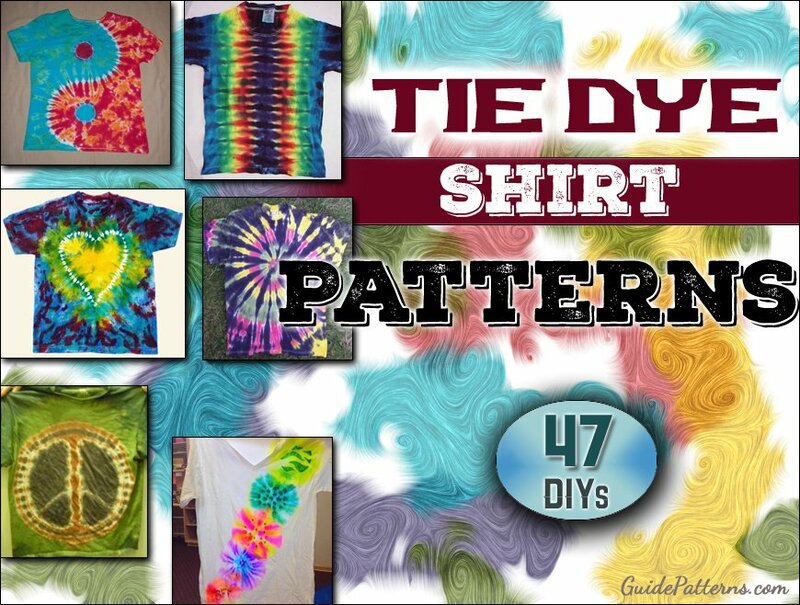 It is just tying and dying according to the instructions and untying it to get the desired pattern. Can you be clear on the type of printables that you are looking for? Thank you for the great info. 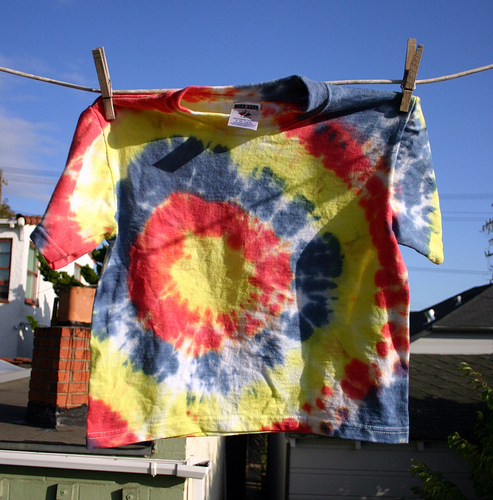 I would like to comment on your advice to ‘not spend a lot of money’ on a tie dye from the mall. This is great advice. Corporations produce mass quantities in order to make big bucks. 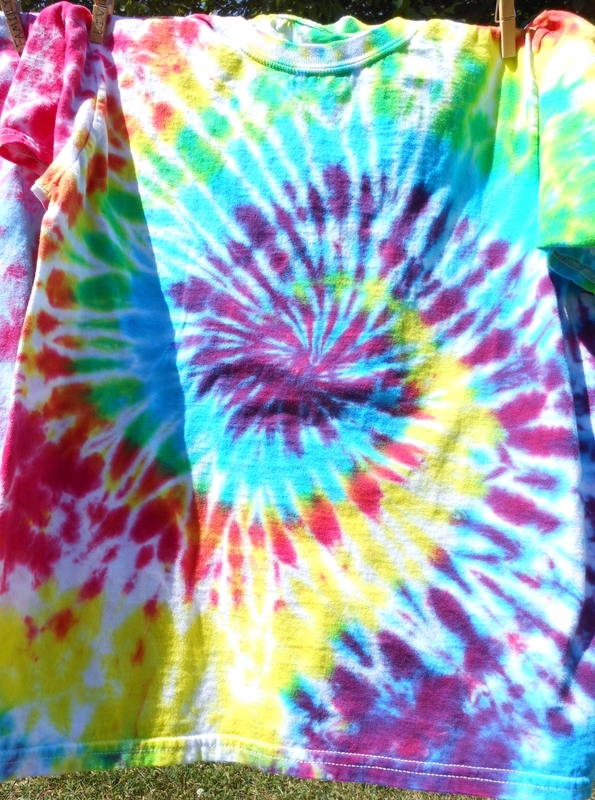 However, if you go to a Dead show or head shop or somewhere where an individual has made a dye, then it is certainly worth paying a good price for one. Once you make a dye, you can certainly appreciate the time that goes into it and you will certainly have one with good vibes!